October 27, 2017 – The Clouds and the Earth’s Radiant Energy System Flight Model 6 (CERES FM6), developed by Northrop Grumman and managed by NASA’s Langley Research Center in Hampton, Virginia, is scheduled to launch November 10 aboard the National Oceanic and Atmospheric Administration’s Joint Polar Satellite System-1 (JPSS-1) from Vandenberg Air Force Base in California. 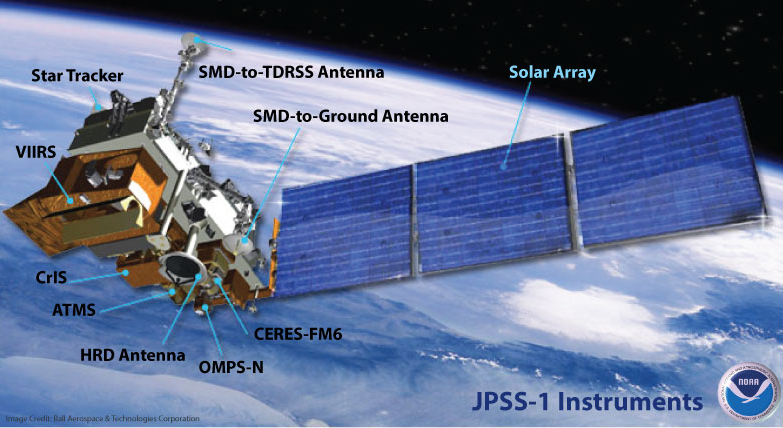 Ball Aerospace designed and built the JPSS-1 spacecraft as well as the Ozone Mapping and Profiler Suite-Nadir instrument (OMPS) in Boulder, Colorado. Ball integrated all five of the satellite’s instruments, including CERES FM6.